My Review: This is a good book. It is a study of survivors and the skills it takes to survive. The author, Ben Sherwood, looks at survival events and those people in them who live and die in an attempt to isolate the characteristics that help individuals survive. He discovers that while chance always plays a roll in survival, and training can enhance a person’s likelihood of living, no single set of skills or personal characteristics will determine the outcome. How Much of Life (and Death) Do You Really Control? You can see that these topics are all over the map, yet Sherwood manages to weave them into a coherent whole. In Part II (Are You a Survivor? ), the author pulls all the threads of the book together, essentially saying that all of us possess some of the skills needed to survive in a crisis situation. He then takes the reader through a psychometric designed to gauge his/her own survival strengths. According to Sherwood there are five main survivor types. These characteristics are thoroughly defined and discussed, with stories of actual survivors and survival situations given to illustrate the characteristic. In addition, there are some twelve survival tools identified and defined. The on-line psychometric (the Survivor Profiler) purports to identify your survivor type and top three survival tools with a high level of accuracy. To access the profiler and determine your survivor type and top three survivor tools, go to www.survivorprofiler.org/getcode to register with an email address and password. You will be sent a unique access code and will be sent to www.survivorprofiler.org to complete your profile. 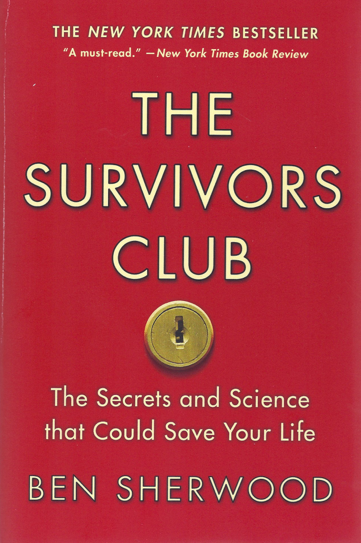 However, your results will mean so much more if you buy and read The Survivors Club. You can buy this book below.